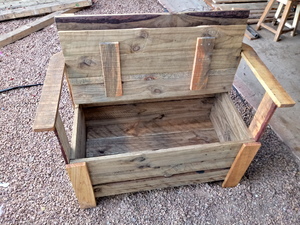 This storage bench is handcrafted with care using the finest quality solid pine. lift up the bench lid to expose large internal storage compartment and seats 2 comfortably. You can put bags, purses, shoes, a blanket, pet accessories, toys, or whatever you want in the storage area. handcrafted to last you many years. It could even become a piece that you pass down to your children and your children's children. 6-seater treated pine pub-style bench - brand new. Free delivery.